54 out of 68 units released were sold within the first week of release – now, that is quite an impressive debut. So the wife and I decided to visit the sales gallery of HOLLAND RESIDENCES yesterday to find out for ourselves what all the buzz is about. HOLLAND RESIDENCES is located on Taman Warna road. In fact, the actual entrance to the development is almost at the exit point of Taman Warna into Holland Road. HOLLAND RESIDENCES resides on a long and rather narrow plot of only 74,000sqft, and consists of 83 apartment units in three 5-Storey blocks. The plot ratio is 1.4, and expected TOP of project is 30th June 2013. HOLLAND RESIDENCES is developed by Allgreen properties, who also has projects like “One Devonshire” (Devonshire Road) , “Viva” (Newton/Thomson Road) and the upcoming “RV Residence” (River Valley Road) under its belt. In terms of orientation of the three blocks, Block 1 is located parallel to Taman Warna. It is nearest to the main entrance of the development, which features a circular driveway with a porte cochere drop-off point and central water feature. Block 3 is located next to Block 1 while Block 5 is diagonally opposite Block 3. Other than the main vehicular entrance into HOLLAND RESIDENCES, there are supposedly 2 other pedestrian side-gates that open out to Taman Warna. From there, it is about a 10-min walk to the upcoming Holland Village MRT Station. Apartment units in HOLLAND RESIDENCES have North-West and South-East orientations. All the loft units are on the ground floor, while all the 3-bedder apartments are served by private lifts. For the penthouses, only the 3 and 4-bedrooms units have private lifts, while owners of the smaller 2-bedder penthouses as well as the 1 and 2-bedder apartments will have to make do with common lifts. However, tennis lovers will be disappointed as there are no tennis courts in the development. There is only one showflat available in the sales gallery – a 1883sqft, 3-Bedrooms Loft unit (Type C1). As you enter through the main door, you arrive into the dining area and then the living area. Both areas are rather small, and comes with 60cm x 60cm marble flooring. The ceiling height is generally 2.6 - 3.2m, except for the living area, which has a “double-volume” ceiling of 6.5m. The living room opens out to the PES area, which looked easily 200sqft (our marketing agent was unable to tell us the exact size). Each loft unit has its own private Jacuzzi at the PES – this looks plush but it makes the PES less functional. The dry kitchen is opposite to the dining area as you enter the main door. To the left of the dry kitchen is a walkway that leads you to the common bathroom, a home shelter and the two common bedrooms. HOLLAND RESIDENCES is one of the rare developments we have seen so far that features both a home shelter and a utility room within the unit (except for the smaller 1 and 2-bedders, which have no utility room). The common bathroom has marble floors/walls, solid surface bath vanity, “Bandini” bath accessories/fittings and “Kohler” WC. The home shelter will provide you with ample space for storage. The 2 common bedrooms, which are very regular shape, are rather small and the wardrobe space provided is hardly sufficient unless you are one that survive on only a couple of shirts and pants. One of the common bedroom also has a strip of PES outside, which further eats into the living space. The wet kitchen occupies only a small long strip behind the dry kitchen, and comes with both high & low cabinets, solid-surface worktop that incorporates the kitchen sink, “Miele” hood/hob/oven/built-in 2-door fridge and even a dish-washer. There is a small yard area with probably just enough space for a washer/dryer, and a utility room that comes with an attached bathroom. Judging from the size of the utility, you will probably have to custom fit a smaller single bed inside if you intend to use this as a maid’s room. There is also a service lobby access between the wet and dry kitchens. The master bedroom is located on the upper level, and accessible via a flight of stairs tucked behind the living area. The bedroom is fairly good size, but the amount of wardrobe provided is again lacking. It comes with a small rectangular shape balcony, which is not very practical (in our humble opinion) considering that you overlook the road – not exactly a pretty sight. The master bathroom is partitioned by a glass panel, so you can actually see your partner showering as you enter through the bedroom door. Similar bathroom fittings and fixtures apply as per the common bath, in addition to a long tub and standing rain-shower stall. • Location – HOLLAND RESIDENCES is located within minutes’ drive from Orchard Road and a couple more from the CBD. It is also a short walk from amenities and F&B outlets in Holland Village, as well as the upcoming MRT. For nature lovers, Botanic Garden is in close proximity – about 15 - 20 minutes walk or a short 5 minutes drive if you prefer to leave the walking until you reach the Garden compound. • The furnishing is of very good quality. Even the staircase leading from the lower to upper level looks very chic in design. • The concept of having both a home shelter and utility room within the unit. Now you do not now have to choose between storage space or maid’s room. • The small living/dining area for the 3-Bedroom Loft, which makes the whole apartment looks rather “stingy” in terms of space. • Although the Loft is supposedly 1883sqft, it does not really feel like an apartment of such size. However, you can understand why when you do the math - at least 300sqft is taken up by the PES/balcony, while the “double-volume” ceiling on top of the living area eats into another 80sqft or so. So effectively you are left with only 1500sqft of “interior” living space. 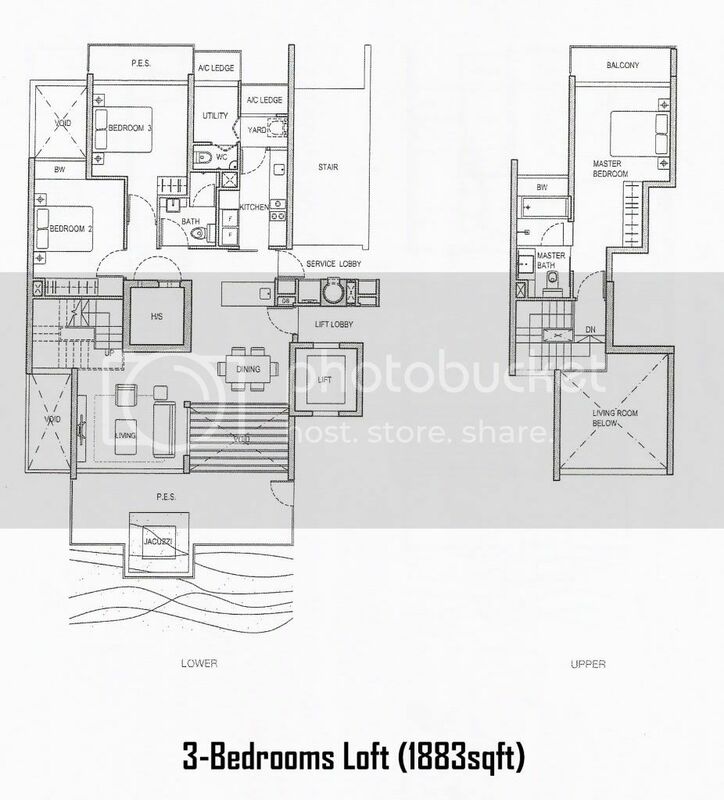 • Looking at the floor plan of the Penthouses, all the smaller 2 and 3-bedrooms penthouses, despite being 2 levels, have all their “interior” living space in the lower level. The upper level is made up of your own private garden and roof terrace – some buyers may be more than happy to pay for these roof top spaces, but such area is not very practical in our book. • Looking at the site plan, some apartment units in Block 3 (Stacks #5, #06 & #7) and Block 5 (Stacks #16 & #17) are located very closely across from each other. So you may want to reconsider about these stacks if you require a lot of privacy. • Taman Warna is a one-directional road – you enter via Holland Ave/Taman Warna T-junction (i.e. where Holland Village Shopping Centre is), and exit at the end of Taman Warna into Holland Road. We find this a rather roundabout way to get in and out of HOLLAND RESIDENCES. • Despite the project being marketed as near to premier schools such as Nanyang and Henry Park Primary, we can only identify one primary school that is within 1-km of HOLLAND RESIDENCES – New Town Primary. So for those parents wishing to enroll their kids into Nanyang/Henry Park but have no affiliations with either, start working on the “school volunteer” or “grassroot” options. As for pricing, the 1883sqft Loft is going at $2.93 million, which translates to around $1556psf. We were told that the psf price for the loft units has already factored in the larger PES and the "double-volume" ceiling. The two 4-bedrooms units (1872sqft) are not released for sale yet, but we understand that they will be priced at least $1800psf. And if the wife and I are really really interested in the 4-bedder apartment, we can always put in a cheque for developer’s consideration. And if there are more interests than units, the sale will be done via balloting. And you think trying to put your kids into good primary school is stressful! Monthly maintenance wise, these ranges from $408 for the 1 and 2-bedders, $476 - $544 for the 3 and 4-bedders and $476 - $612 for the Penthouses - a tad high but one has to consider the small number of units in this project. No Comment to " HOLLAND RESIDENCES (Review) "